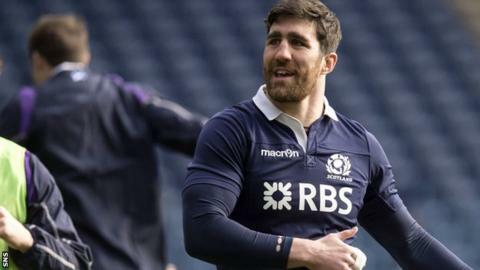 Kelly Brown is determined to work his way back into the Scotland squad after being overlooked for the Six Nations. The 32-year-old former captain failed to make Vern Cotter's 32-man pool but is convinced he can still add to his 64 caps. "It's clearly disappointing, but selection is a funny thing," Brown told BBC Scotland. "I want to play for Scotland and I certainly feel I can play for Scotland. I don't feel over the hill yet." Saracens flanker Brown began last season's Six Nations campaign as captain, although he was dropped later in the tournament. Since then Cotter has replaced Scott Johnson as head coach and Brown believes he has plenty still to offer, with the World Cup later in the year. Brown has played once under Cotter, in a 19-17 win over Canada in June, but was not selected for the Autumn internationals. "I don't think it's a case of what has gone wrong," Brown added. "A new coach has come in and he's got slightly different ideas. "Vern phoned me and we had a frank and open conversation, and I would say it was a very good conversation. "He's given me a couple of areas that I need to work on and that's what I'll do, because I'm certainly not a quitter and I'll keep on working as hard as I can, trying to force my way back in. "All I can do is look at myself and the areas of my game that I need to keep improving, and that's what I'll do. I feel I have a few years left in me, but it's up to the coaches. "I just need to look at the factors I can control, which is how I'm playing, and how I train, so I can keep on improving. "One thing I have learned over the years is I'm a fairly stubborn guy, so I'll just keep on fighting." Brown, who recently reached the 100 appearances mark for Saracens, also paid tribute to his club for their support. "Saracens is an absolutely fantastic club and I consider myself very lucky to be a part of it," he added. "At times in the past when I've been dropped they've been incredible and there's a few of the guys at Saracens who have been in and out of the English set up - it's a very caring club."